In 1982, when I was 26 years old, I decided to travel to Europe and Africa for one year. This was the beginning of my antique business. When I was in London at the end of my trip, I discovered all kinds of antique jewelry steeped in history and culture. It was then that I was awakened to the world of antique arts. Our gallery now sells Art Nouveau and Art Déco glass, porcelain, lamps, music boxes, antique jewelries, and more. Through the course of running this business, I have been reminded of the sophistication of Japanese culture. In the future, we would like to introduce European culture into the daily life of Kyoto, a city in which both the old and new are welcomed and deeply respected. For example, original Art Nouveau glass works by Daum and Gallé, glassware by Baccarat, ceramics of Meissen ,antique jewelry ,etc. If you have any questions, please do not hesitate to contact us by email or fax. We can assist you in Japanese by phone, but offer English and Chinese assistance by email and fax. 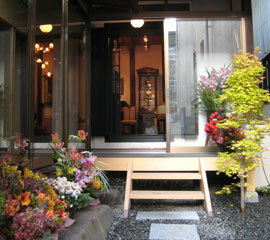 5-minute walk from the subway Karasuma Line Shijo Station. You can enjoy the historic ambiance at our gallery, which is a beautifully renovated 100 years old store and tea house, with a lovely Japanese garden in the center of Kyoto. Please feel free leisurely enjoy time away from your busy schedule while browsing through our many beautiful works at our gallery. We look forward to welcoming you here at our gallery. We’re easily accessible by public transportation, or by car and a parking lot is available for your convenience. text and images on this website without permission.